Do you want to know how stars are born? Well here goes. The birth of a star begins when massive clouds of dust and gas start to collapse and break down. How does this happen. It happens through the force of gravity. Gravity bounds the elements together to create a Protostar. The protostar is basically a baby star, and grows into a star through its life cycle in the same way we are born and grow. The main process of all stars birth is called ‘Nuclear Fusion’ nuclear fusion happens in very large clouds on gas called nebula. When nuclear fusion starts in a nebula and reaches a temperature of over 10,000 degrees the star begins to form. The new baby star that as we know now is called a protostar can star its very long life on the universe. Gravity continues to play a part in the stars birth and continued life cycle. The mass of the star determines the colour of the star, which allows scientists categorise the type of star. Scientists can then also try and confirm the amount of energy the star can give off. The star will then start its journey through its life cycle from birth to death. For more information and further reading on a stars life cycle, see TAB. 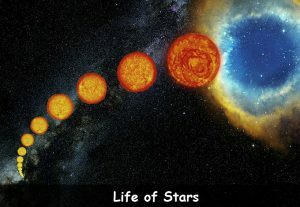 Star Life-cycle-Supernovas. # 1. 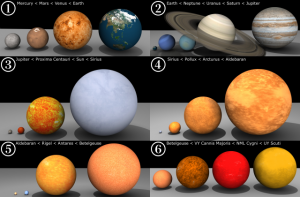 It is believed that almost every star has the same chemical composition. That basically means that all stars are made up of the same thing. # 2. 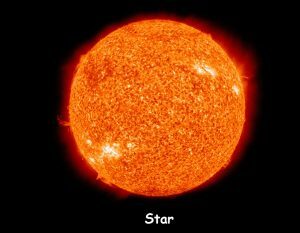 If a star is created really large after its birth, the star will live for less time as a smaller star. Q. What is a Protostar? Q. 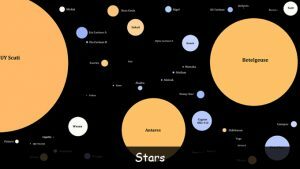 How many degrees does it need to get to for a star to star forming? Q. What determines the color of a star? Q. What is the name of the force that creates the birth of a star? Key Vocabulary Gravity. Energy. Nebula. Nuclear. Fusion. Life. Cycle.